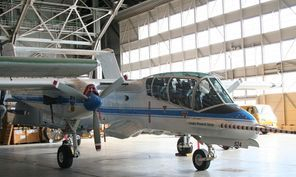 The OV-10 had a central nacelle containing pilots and cargo, and twin booms containing twin turboprop engines. 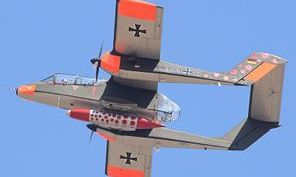 The visually distinctive item of the aircraft is the combination of the twin booms, with the horizontal stabilizer that connects them. 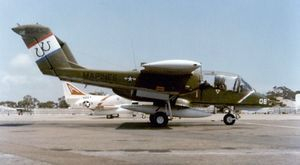 The aircraft's design supported effective operations from forward bases. 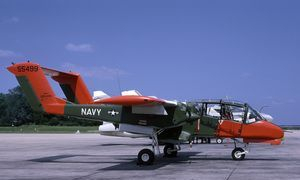 The OV-10 can perform short takeoffs and landings, including on aircraft carriers and large-deck amphibious assault ships without using catapults or arresting wires. 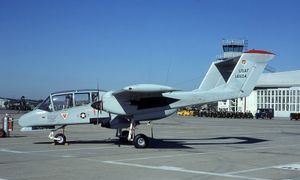 Further, the OV-10 was designed to take off and land on unimproved sites. Repairs could be made with ordinary tools. No ground equipment was required to start the engines. And, if necessary, the engines would operate on high-octane automobile fuel with only a slight loss of power. 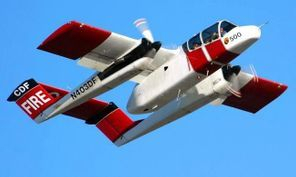 The aircraft had responsive handling and could fly for 5 1/2 hours with external fuel tanks. The cockpit had extremely good visibility for a tandem pilot and co-pilot, provided by a wrap-around "greenhouse" that was wider than the fuselage. North American Rockwell custom ejection seats were standard, with many successful ejections during service. With the second seat removed, it can carry 3,200 pounds (1,500 kg) of cargo, five paratroopers, or two litter patients and an attendant. Empty weight was 6,969 pounds (3,161 kg). Normal operating fueled weight with two crew was 9,908 pounds (4,494 kg). Maximum takeoff weight was 14,446 pounds (6,553 kg). The bottom of the fuselage bore sponsons or "stub wings" that improved flight performance by decreasing aerodynamic drag underneath the fuselage. The sponsons were mounted horizontally on the prototype. Testing caused them to be redesigned for production aircraft; the downward angle of the sponsons on production models enssured that stores carried on the sponsons jettisoned cleanly. Normally, four 7.62 mm (.308 in) M60C machine guns were carried on the sponsons with the M60Cs accessed through a large forward-opening hatch on the top of each sponson. The sponsons also had four racks to carry bombs, pods, or fuel. The wings outboard of the engines contain two additional racks, one per side. Racked armament in the Vietnam War was usually seven-shot 2.75 in (70 mm) rocket pods with white phosphorus marker rounds or high-explosive rockets, or 5 in (127 mm) four-shot Zuni rocket pods. Bombs, ADSIDS air-delivered/para-dropped unattended seismic sensors, Mk-6 battlefield illumination flares, and other stores were also carried. Operational experience showed some weaknesses in the OV-10's design. It was significantly underpowered, which contributed to crashes in Vietnam in sloping terrain because the pilots could not climb fast enough. While specifications state that the aircraft could reach 26,000 feet (7,900 m), in Vietnam the aircraft could reach only 18,000 feet (5,500 m). Also, no OV-10 pilot survived ditching the aircraft.